This man has a small business providing water to his community, for a fee. He pipes it down from the slopes of Mount Kilimanjaro to his home in southern Kenya. What’s the best way to ‘do no harm’ when relying on others to collect water during bike travel? I don’t have a simple answer, but I do have some blunders and learnings to share (1,200 words). Outside a small home on a hot afternoon in Tajikistan, Ilona and I approached a water tap on a cement pedestal. A woman and a girl walked over, but we were there first. We filled our bottles and stepped aside for them, and then something strange happened: the tap stopped giving water. I looked at the women, they looked at me, and I pedalled away. Collecting water has felt problematic when it has seemed to be at the direct expense of someone else. More recently this happened in a dry and lumpy region of Kenya, where excitable goats were everywhere but boreholes were scarce. I asked for help inside a small dwelling guarded by fences of dead acacia. A teenage girl accepted my water bag, disappeared momentarily and returned it jiggling, full with what we needed for drinking and cooking in camp that night. It was unlikely that the girl’s home contained a spring, tap or well and I imagined her alternatives. That perhaps she had walked to a water source and returned with what the family needed for their day, or as much as she could carry. From this I had subtracted ten litres, her time, her effort. I wanted to compensate, and handed her a rumpled 100 shilling note, about 1 US dollar. What to make of this? Did I do a bad thing, a good thing, neither? If this post answered the question ‘should you ever pay to collect water?’ it would be like the blind leading the blind. Imagine a large funnel, and tumbling down into it are the wildly varying circumstances, people, places, seasons, cultures, emotions that lead the bicycle traveller to another instance of water collection. These circumstances converge only for a brief moment, when the water bag is full and it’s time to leave. The choice between giving something in thanks, or not, is made. The potential consequences mushroom, growing quickly in number and form, largely hidden from us. These consequences concern me. I think it is difficult to predict them with confidence, but that doesn’t reduce the importance of considering them. This choice feels the most important when I realize that I have probably screwed it up. In a public square in a Tanzanian village, women and children waited on the ground around a rectangular cistern full of water. A rainbow of jerry cans and plastic buckets waited with them. An older man took responsibility for me and filled my water bag with a plastic scooper, dribbling excess onto my legs and shoes, onto the parched ground. Under the gaze of the silent sitting people, I gave him the equivalent of about 60 cents US in Tanzanian shillings. I rode away feeling uncomfortable, like I had just corrupted something that I couldn’t quite articulate. I paid that man in reaction to reading about how ordinary Tanzanians meet their water needs. For a period of the 20th century, the government bore all costs of water infrastructure, and that period is over. Communities are expected to foot some of the bill for their local water infrastructure, maybe 25%. And at some water collection points there is a small per-litre tariff collected from each person, to pay for ongoing maintenance and testing. At least, that’s the idea. The cistern no longer represented a convenient way to collect our afternoon’s water. I saw an investment made by a low-income community, and its members not only having to wait, but also having to pay each time they collected. I imagined the man helping me as a member of the community water team. But, whoops: I didn’t confirm any of this. How unlikely that I paid the standard amount and the correct person. It’s entirely possible that there wasn’t a tariff at all, that the cistern wasn’t a community investment, and that I was simply rewarding assertive behaviour. Perhaps I made a powerful statement to everyone watching, that foreigners in need of water will pay, should pay, to whoever acts in charge. Collecting water is intimate: you share a need with others around you that is simple, urgent and universal. I’ve undergone this experience perhaps a hundred times, and often had to rely on some sort of help—usually just being pointed to where the water source is. I almost never compensate with food or money. In light of all the unknown consequences, I feel that giving anything beyond gratitude is more likely problematic than beneficial. My reasons for saying ‘no’, however, have significantly changed since my time in Central Asia. I’m really glad they have. I used to be guided by entitlement. This is part of the reason I didn’t act differently in Tajikistan, that I didn’t share my water with the women and girl I had (arguably) deprived. Later, in Kazakhstan, I approached a settlement on a scorching afternoon on the steppe, entering a shop and insisting on free water. The women demurred, the only water available was by purchase on their shelves. ‘Water should always be free for everyone, especially for bicycle travellers,’ I grumbled in my head. Securing the day’s water demands great time and effort from many people, particularly women and children in countries where the odds are already stacked against them. In those moments where I’m confronted face to face with their efforts, and feel I’ve become a part of their burden, giving a gift is so tempting. My pull in this direction is tempered by other thoughts that feel equally uncomfortable: the suspicion that I’m simply looking for a quick and easy way to reduce my guilt, and that gifts have a tendency to be unfair, to cause resentment and expectations. To be honest, neither choice feels great. Maybe that’s the point. I imperfectly pursue other contributions. One strategy is avoidance, minimizing the time and effort asked of others. This does not mean that I don’t ask for help, it just means that I try to think ahead about what I’m requesting. 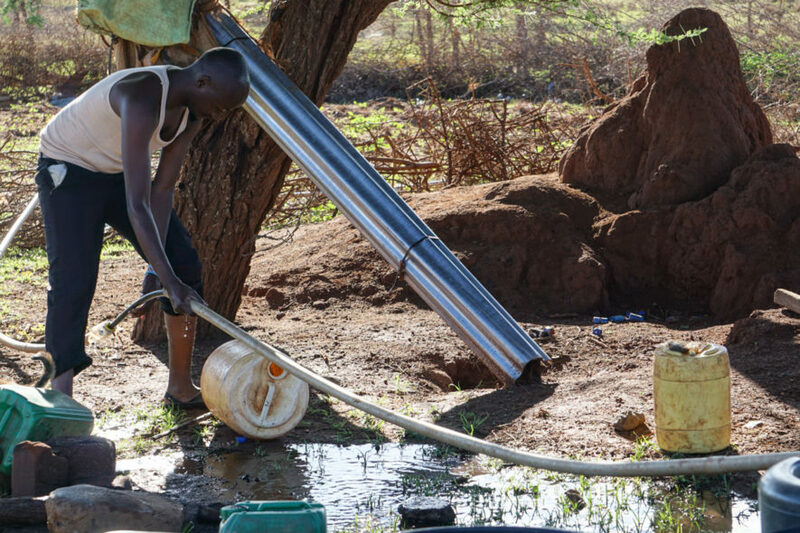 When the vibe is a welcoming one, hanging around to observe the local water situation can be a way to learn more, if you believe that learning about the lives of others is valuable for everyone involved. I show gratitude. I don’t jump a line without being told to—there’s often a long line. If I’m alone and need someone to either hold my bag or pump the water, I try to return the favour. Sometimes I provide entertainment by pumping water with my inevitably poor technique—I haven’t quite mastered the jumping and bending that others use. People sometimes look bemused at my oafish behaviour. We continue to collect water one day and ten litres at a time. I hope as the months pass, I develop an even better approach than the one I have now. Previous How do you find flat spots to camp?